Tigers, here’s a Subway UST Branch Anniversary Treat that will surely stop you and your tummy from growling loud! Your Friday food trip plans are taken care of, thanks to Subway UST Branch Anniversary Treat. 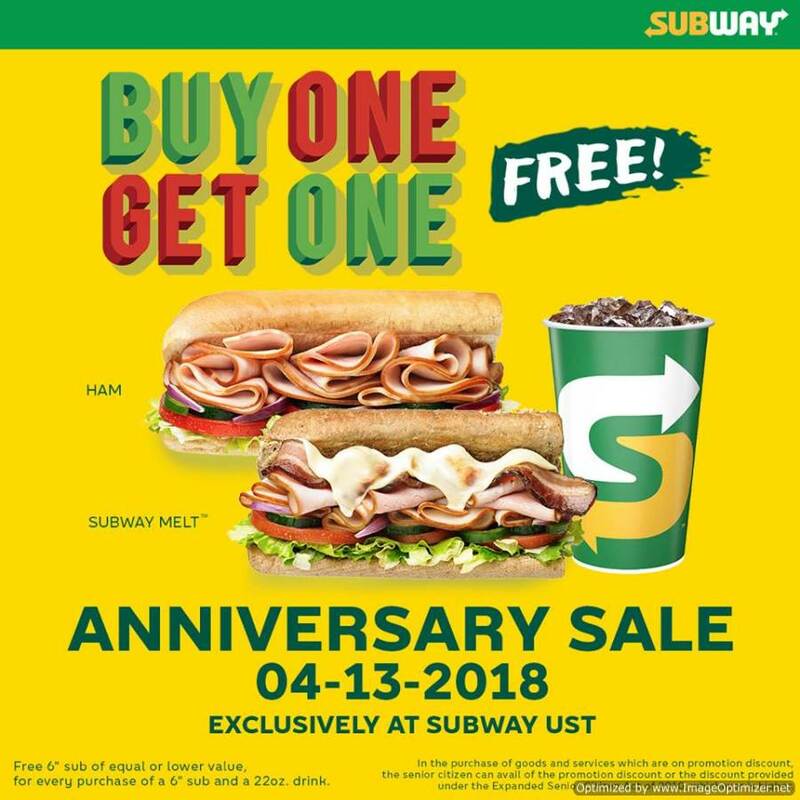 The famous sandwich shop is bringing a Buy One, Get One promo exclusively at their UST branch tomorrow, April 13, 2018. End the stressful work week with a Subway® goodness and of course, free sandwiches! For every purchase of a 6-inch sub and a 22-oz drink, you get another 6-inch sub of equal or lesser value for FREE! Terms and Conditions Apply. The SUBWAY® restaurant chain is the world’s largest submarine sandwich franchise, with more than 33,000 locations in over 92 countries. The first branch in the Philippines was established in Glorietta 1 back in 1990. Today, Subway has 12 branches in the Philippines, serving freshly made subs to our customers every day. Visit their official Facebook Page for more details and updates.